Whether you’re an experienced store owner or a newbie, by now you should’ve already come to terms with having to create backups before each small or significant website modification. Though it might seem obsessive, to worry about safety to that degree, but it is, in fact, just a rule of proper website management. Migration of data, especially for large businesses, is a complicated and, at times, risky procedure, so Cart2Cart takes the security aspect of it very seriously. We create backups on your source and target stores before each migration and even before the free demo migration (if you choose so). However, some might still want to go an extra mile and create database backups on their own. Understandably - that’s the one kind of paranoia we fully endorse. 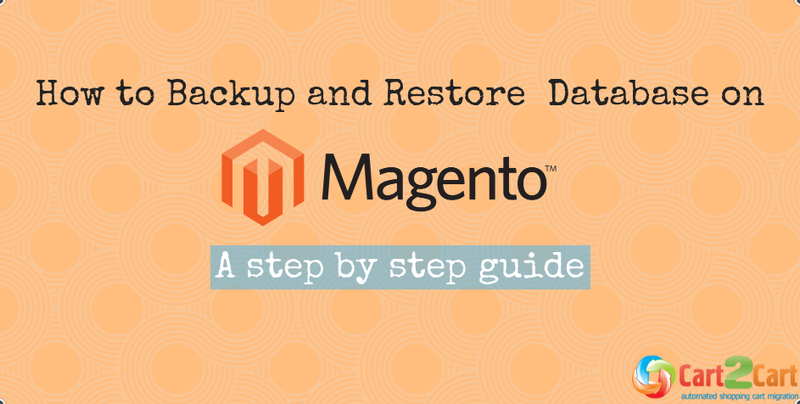 So, if you happen to be a Magento running security freak, the following article is just for you - it’ll describe two simple ways of making data backups and restoring sites from them properly on Magento. System Backup is the most radical one - it’ll pack your entire source code with database into one tar archive. Database and Media backup will save your database and media folder’s content. 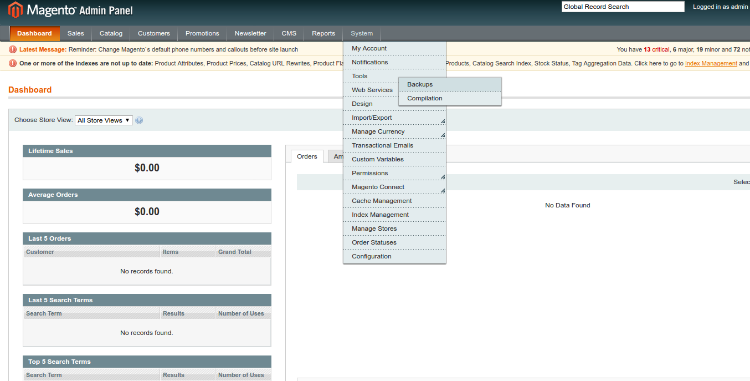 Entities like store themes are not included. Finally, Database Backup is self explanatory - it will take your Magento store data dump. See for yourself which option to choose, and click one of the orange buttons. 4. Confirm your intention in the Warning window and specify backup name in the box that’ll appear next. Also, you’ll be provided with an option to turn the maintenance mode while the procedure’s is happening. We recommend putting a tick next to it, so that no database changes happen whilst you backing it up. 5. Wait for the the Database backup has been created! message to light up. When it happens, pat yourself on the back - you’ve done good. 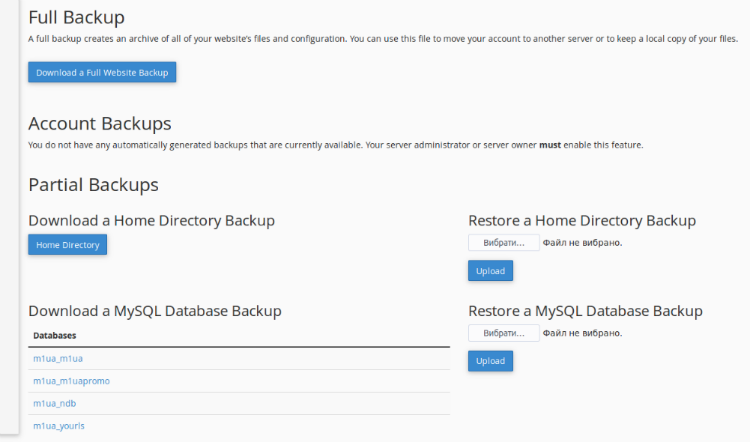 Besides Magento’s dashboard, you can log in to to your hosting admin panel and backup database from there. 2.Again, choose for yourself what kind of website backup to create - full, partial, or just the database backup. In case of the most later option - click on on the name of the needed database. 3.That’s it, in a few minutes look for the database archive in your Downloads folder. How to restore data from database backup? Restoring Magento databases doesn’t really deserve a separate instruction since the entire procedure consists of one step. Step to Backups in the Files section, under Restore a Database MySQL Backup, upload your backup archive. These are not the only methods to backup and restore Magento database but certainly the easiest ones. Might you have other suggestions on the subject, feel free to share them in the comment box. If you'd like to switch to Magento shopping cart, Cart2Cart will gladly help, try it for free right now! Run your business safely, we wish you the best of luck. 16 thoughts on "How to Backup and Restore Magento Database [Step-by-Step Guide]"
Thanks a lot for your positive commentary. Our team appreciates it a lot! Hope to hear from you soon. Thank you a lot for your positive feedback. You’re welcome to read the rest of our useful articles. It would be great to hear from you more. Nice to hear that you like our writings so much! Thanks for your positive commentary. Hope to hear from you more. Keep in touch! Glad to know you value our writings so much! Please, don’t forget to share the post you like most of all. Thanks for your time and kind words. Hope to hear from you more! Ithink that one of the biggest things you have to include is ergonomics and efficiency. One often feeds into the other when it comes to office comforts, i have found. Thanks for these tips. Hello! Thank you for the inspiring words. Please, accept the warmest wishes from the whole Cart2Cart team. And don’t forget to share the posts you like most of all. Hi, thank you for the great commentary. Please, share your ideas with us, we appreciate it much!